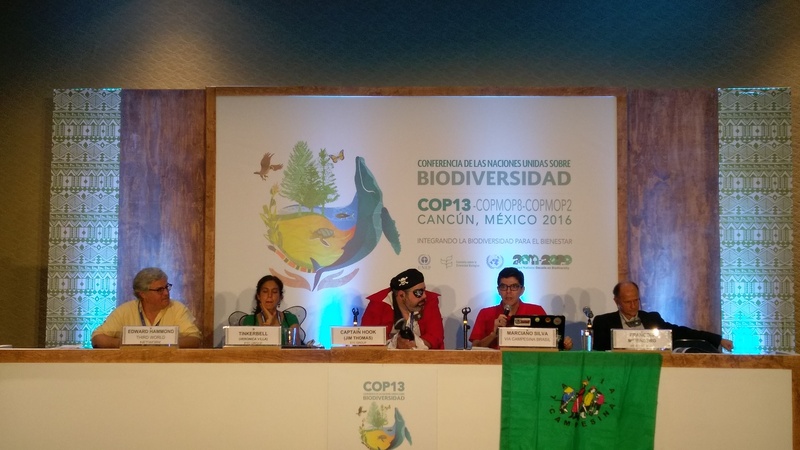 Press Conference for the Captain Hook Awards for Biopiracy at the COP13 Negotiations. This is the second in a series of blogs about the participation of CAGJ/AGRA Watch in the 2016 United Nations Conference on Biodiversity in Cancun, Mexico. Read the first blog: Convention on Biological Diversity: what is it and why do we participate? 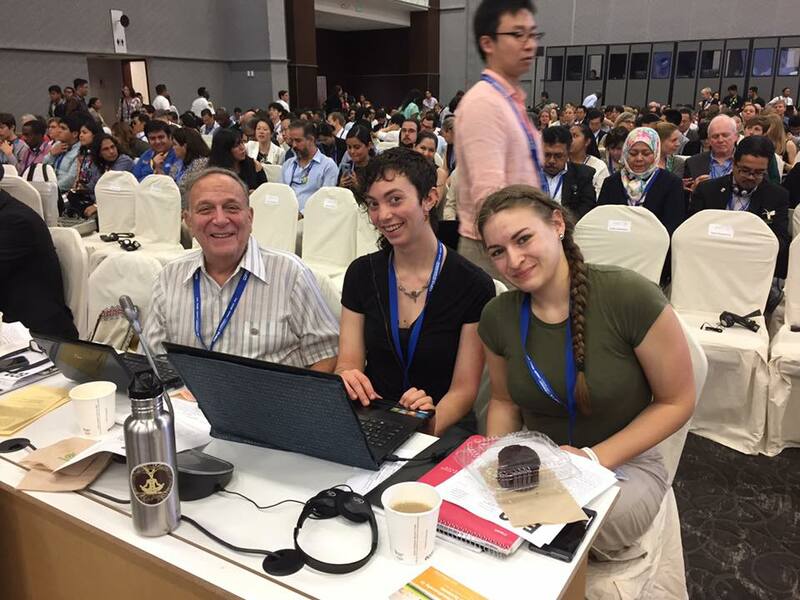 Phil Bereano, Simone Adler, and Johanna Lundahl during a Plenary session of the CBD. Beginning this past Sunday and going through December 17th, the two week United Nations Conference on Biodiversity in Cancun, Mexico is organized into different levels and spaces of negotiation, dialogue, and presentation. Throughout, the participation of attendees to the Conference varies by process and rank. The Convention on Biological Diversity (CBD), the Nagoya Protocol on Access to Genetic Resources and the Fair and Equitable Sharing of Benefits Arising from their Utilization (aka Access and Benefit Sharing, ABS), and the Cartagena Protocol on Biosafety are all being negotiated at this Conference. Each has its own governing body. For the CBD, it is the 13th Conference of Parties (COP 13); for the ABS it is the 8th Conference of Parties Serving as the Meeting of Parties (COP-MOP8), and for the Cartagena Protocol it is the 2nd Conference of Parties Serving as the Meeting of Parties (COP-MOP2). This UN Conference is unique in that all three COP and COP-MOP are meeting simultaneously, as the content of each are inextricably related. AGRA Watch partners the African Centre for Biodiversity and the PELUM Association in collaboration with the Alliance for Food Sovereignty in Africa issued a joint press release today. Read the full text below. The authoritarian nature of the African Intellectual Property Organisation (ARIPO) Secretariat and its undemocratic processes are scandalous and unacceptable. Locking African farmer representatives and civil society out in order to allow unfettered draconian regional law making is deeply disturbing. What is at play here is entrenching an agricultural future for smallholder farmers in the 19 ARIPO countries that will ensure that profits accrue mainly to the corporate sector and a tiny group of elite players that can engage in the commercial agriculture value chain, while pushing the already marginalised majority of smallholder farmers further into hunger, poverty and dispossession. ARIPO will host an Administrative Council meeting 5–8 December 2016 in Harare, Zimbabwe for its 19 ARIPO Member States, to adopt deeply troubling draft Regulations to implement a highly contested and controversial regional law on seeds – the Arusha Protocol on Protection of New Varieties of Plants (PVP). ARIPO has refused point blank to allow any African farmer representative or civil society to attend the December meeting on the spurious and frivolous grounds that ARIPO has no cooperation agreement with such civil society. Yet ARIPO has in the past, allowed a small handful of people representing smallholder farmers and from African civil society to attend Administrative Council meetings. Civil society groups have consistently and constructively engaged with the drafting of the Arusha Protocol and several versions of the draft Regulations, and have submitted sets of substantive comments. In these comments we have raised serious concerns. We continue to have these concerns and also in relation to the most recent Draft Regulations that are up for decision making at the December meeting. These include the impingement of national sovereignty; the failure to safeguard Farmers’ Rights and farmer seed systems; the failure to prevent bio-piracy and undermining the implementation of international Treaties such as the Convention on Biological Diversity (CBD), the Nagoya Protocol on Access and Benefit Sharing, and the International Treaty on Plant Genetic Resources for Food and Agriculture (ITPGRFA) as well as various international instruments on human rights. The ARIPO Secretariat is hell bent on excluding those that represent the interests of smallholder farmers from key meetings where regional laws are being adopted, yet opening the doors to foreign interests. This has already happened in July 2015, when farmer representatives and African CSOs were deliberately shut out of the Diplomatic Conference held in Arusha, Tanzania when the Protocol itself was adopted. We call upon all Member States of ARIPO to ensure open, transparent and democratic regional law making. Further we impress upon Member States to ensure that smallholder farmers have the rights to continue to access and use all seed freely without any impediments, including protected varieties, through saving, exchanging, and selling on the local markets in Africa. Such practices are the backbone of farming systems in the ARIPO region and support livelihoods, provide food, sustenance and nutrition for many millions of people on the continent. Member States must ensure that mechanisms are put in place to operationalise their right to object to the plant breeders’ rights from being applicable and enforceable in their territories, as allowed by Article 4(1) of the Protocol, and to ensure that appropriate safeguards to prevent bio-piracy are put in place to prevent the exploitation of farmers and disallow breeders from hiding acts of bio-piracy behind confidentiality rules. Grain, an international non-profit focused on supporting small farmers, and community controlled food systems, provided an update on the free trade agreements that affect farmer’s rights to save and plant seeds of their choosing, in a piece called New Trade Deals Legalize Corporate Theft, Make farmer’s Seeds Illegal. The article is the latest in a series of opinion pieces called Against the Grain, published by the non-profit. Farming is production at its most fundamental. Today it is often claimed that the agricultural revolution was humanity’s most transformative innovation. And whether you see the first seed sown as our original sin or as the beginning of civilization there is little debate over one fact: farming irreversibly influenced the fate of humanity. It was the prerequisite for the growth of cities, the division of labor, and for so much subsequent history. Farming is also human agency at its most unadulterated. The knowledge acquired by the world’s agriculturalists—how to harness the powers of nature for our nourishment, how to select and save the best seed for the following year, how to foster fertile soil and channel life-giving water to crops—all this became vital and empowering. With the development of farming, humans became active agents on this earth in new, more powerful ways than ever before. Historically, food production has been the source of most subsequent forms of production: without farming there would be no freedom from the incessant search for food; there would little art or architecture, no surplus to feed doctors, politicians, and teachers. Even today, with a diminishing portion of the world’s population involved in farming, most within the development community agree that a robust farming sector is almost always necessary for sustained economic growth. And yet many of the same politicians and development economists who acknowledge the importance of a sustainable agricultural sector also treat farming merely as a means to industrial ends. Agriculture becomes the slave of industry, exploited to feed the voracious appetite of urban factories with raw materials, financial capital, and displaced farmers themselves. In this model, it is often forgotten that farming is the source of nourishment for each and every human body; it is the essence of production and not merely a tool for capital accumulation. It is strange then that modern farmers—the archetypal producers—have been reduced by the economic and technological hegemony of agribusiness to the status of consumers. The past century has witnessed a steady penetration of farming by capital—formerly self-reliant farmers coaxed and pressured into purchasing expensive inputs such as fertilizer and seed held by an increasingly small number of transnational corporations. This capital-intensive agriculture leads to a vicious cycle of debt and dependency from which it is difficult to escape. Today, food producers at all points along the spectrum, from large poultry farmers in America to small potato farmers in the Andes, have been significantly disempowered by corporate heavyweights. Agribusiness has long sought to consolidate corporate power over agriculture, gaining ground with hybrid seeds and chemical inputs manufactured during the mid 20th century. The most recent way in which these companies reduce food producers to consumers is through genetically engineered (GE) seed. As the promoters of this technology are eager to point out, humans have been manipulating seed for millennia, selecting desired characteristics and bringing these forward for the next generation. However, these corporations fail to acknowledge that there is a crucial difference with GE: this seed manipulation takes place not by farmers on the land but instead by scientists in the lab. These companies, moreover, appropriate seed developed by farmers over thousands of years and then ‘improve’, patent, and sell it back to the same farmers as an original product, claiming sole authorship. Labeled biopiracy by critics of GE, it is an action that clearly illustrates the dynamic between seed corporations and farmers. Philanthropies and their private sector partners are also seizing on the growing hunger and climate crisis to push GE on small farmers in the developing world, particularly in Africa. This ostensibly well-meaning effort to foster development is based on several questionable practices and assumptions including a failure to acknowledge the deleterious history of farmer debt and dispossession, environmental degradation, and social stratification that has long accompanied this capital-intensive agricultural paradigm. The word ‘farm’ comes from the Proto-Germanic word ferhwo meaning ‘life force’ or ‘being’ and is related to the Old English feorh meaning ‘spirit’ or ‘life.’ Etymologically this reflects the vital place of farming as a source of human productivity. Yet today, in a global economy geared towards limitless growth, consumption is king and even farmers, the original producers, are rendered sterile, manipulated into becoming consumers on their own fertile lands. AGRA Watch is a grassroots, Seattle-based group that challenges the Bill and Melinda Gates Foundation’s problematic agricultural development programs in Africa, including the Alliance for a Green Revolution in Africa (AGRA). In contrast, AGRA Watch supports African-initiated programs rooted in agroecological and indigenous farming practices, social equity, and food sovereignty – the right of peoples to define their own food and agriculture systems. AGRA Watch Create a free website or blog at WordPress.com.